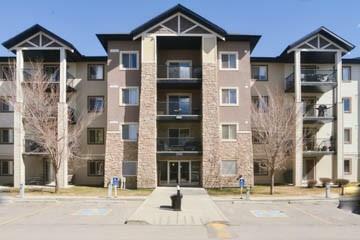 Two bedroom, two bath suite in modern complex in the southwest. You'll feel like you own the neighbourhood enjoying your very private 10x10 deck overlooking the environmental preserve park.The open design suite is painted in stylish, modern colours from the front door through the living room and dining room to the breakfast bar that bounds the sunny kitchen. Upgraded black appliances, including dishwasher and microwave, and generous cabinetry ensure kitchen chores are a breeze.The spacious master bedroom with a walkthrough closet and four piece bath is a peaceful sanctuary from the day-to-day. The second bedroom boasts excellent views of the reserve to enjoy as the seasons go by.In suite laundry and underground titled parking round out the features. 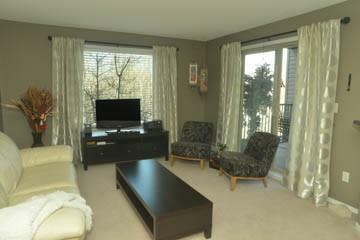 Excellent SW location with shopping, auto and banking services a short walk away. 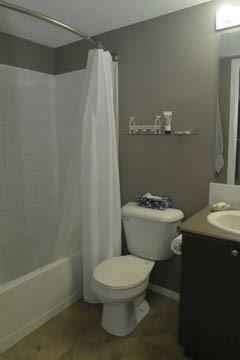 Condo fees include all utilities except Internet/TV.